Scene from the Soga drama Kayou-kami chidori Soga, which premiered in 1750. Asahina no Saburō is attempting to throw his opponent Soga no Gorō from his horse. The wildly flapping sleeves of Gorō’s garment are always a sign of a violent struggle in kabuki. The print is a valuable example of early colour printing, initially introduced in ukiyo-e in the mid-18th century as benizuri-e – two-colour printing in red and green. The scene comes from the play Kayou-kami Chidori Soga, which was performed on the fifteenth day of the first month of the third year of the Ken’en Era (1750) at the Ichimura-za theatre. The grimacing hero Asahina-no-Saburô, played by Bandô, Matahachi, kneels on one leg in front of a backdrop with a blossoming plum tree. With a furious expression he tugs with both hands at the bridle of a dappled horse, which tosses its head in the air defiantly. The younger of the two Soga Brothers, Gorô Tokimune, seems to be losing his balance on the horse. He stretches out his arms in a violent movement. In one hand he holds a long sword, with the other he makes a defensive gesture. Danjûrô’s robe is decorated on the right sleeve with the mon (crest) of the Ichikawa family: rice measures, one inside the other. The other sleeve bears a tea blossom under a roof, the Soga crest. Butterflies on the robe are the identifying symbol of Soga, Gorô. Matahachi’s robe partially reveals the crane mon of the Bandô clan. Next to this is the stylized character for “East” in one of the usual round cartouches. This is the second character of his family name. The scene depicted on the woodcut print shows the episode known as “Tugging at the Reins.” The elder of the Soga Brothers, Jûrô Sukenari, has invited Hatakeyama, Shigetada, the strong and faithful vassal of Minamoto-no-Yoritomo. Also present is Asahina-no-Saburô, the mighty hero. Then Oiso-no-Tora, who waits on the guests, makes the mistake of first serving wine to her lover Jûrô, instead of to the honourable guest, as was the custom. The latter is insulted and a fierce argument ensues. Gorô hurries to the aid of his brother. On his arrival at the gates, Asahina tries to pull him from his horse by force. But he does not succeed. The actor Bandô, Matahachi achieved his breakthrough in the role of Asahina shown here, having already played on the stage since 1740. Following this success, he changed his name to Mihachi. He died in 1770. According to contemporary accounts, he was one of the best aragoto performers. Danjûrô III, who here plays the popular Soga here Gorô, was an adopted son of Ichikawa, Danjûrô II (1688-1758). Little is known about him as a person, but he must have made an exceptional impression on his contemporaries. It is considered certain that he was born in 1721 as the son of a businessman, the owner of the Edo-ya (publisher’s shop?) in the Kobiki-chô quarter in Tôkyô. He began his stage career as a mere seven-year-old. Danjûrô II adopted him at this age, probably in 1727. 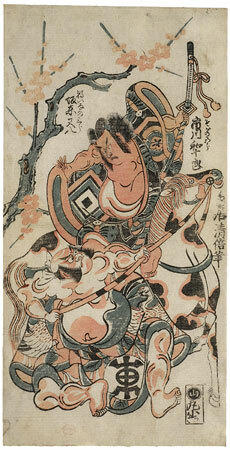 A print from this year by Torii, Kiyonobu II shows him as a small boy in a heroic role, his toys at his feet. The inscription reads: “Ichikawa, Masugorô, adopted son of Ichikawa, Danjûrô.” The great actor had given him this name himself, which refers to the mon of the Ichikawa, the rice measure (masu). In 1735 Danjûrô II passed the name on to him and took for himself the name Ebizô. A sheet by Torii, Kiyomasu II identifies the young actor with his new name (1735). But in 1740 he changed his name again to Wajurô (wa- Japan). We do not know the reasons for his abandoning the crowd-pulling name of his father. He appears with the name “Wajurô” on our sheet from the year 1750. He died at the age of 32 in 1753, A short time afterwards, Danjûrô II adopted the actor Matsumoto, Kôshirô II (1711-1788), who is thought to have been his own, illegitimate son and who dominated the stage in the following decades as Danjûrô IV.